My family loves Shepherd’s pie! I “reinvented” it in order to satisfy my “sweet potato” tooth. I love the mushrooms and rosemary in this- it gives it an earthy and warm taste! Cook sweet potatoes in microwave or oven. You can peel them or leave the skins on- your choice! Allow to cool some. Mash in a medium bowl with garlic powder, yogurt or sour cream, Earth Balance butter and salt and pepper. Set aside. Brown turkey in pan over medium heat. Remove and saute carrots, celery, onion, mushrooms, and garlic in the same pan for 5-7 minutes. Toss turkey back into pan and add tomato paste, broth, salt and pepper, and fresh rosemary. Mix and pour into a 9×13″ pan. 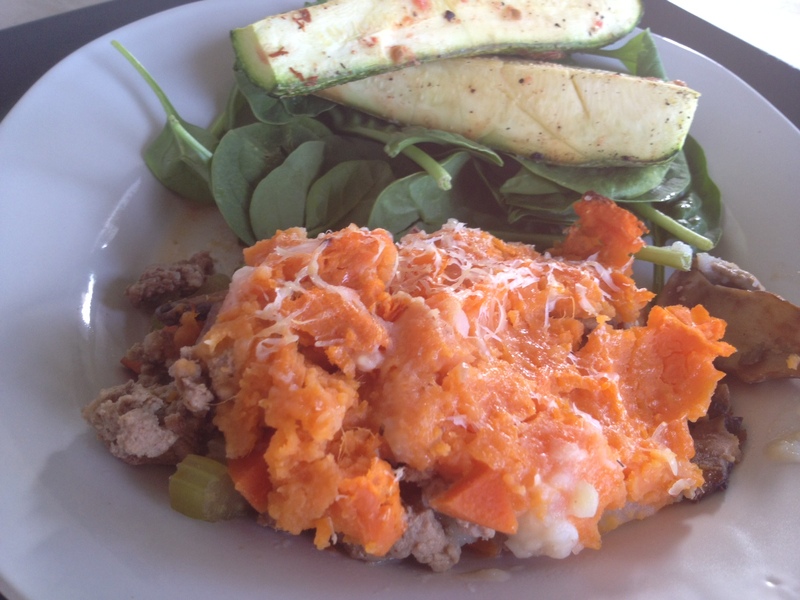 Top with sweet potato mixture and then grate Parmesan cheese over the top. Bake at 350 for about 20 minutes. Turn on broiler for 3-4 minutes if cheese is not browned to your liking when cooking times ends.